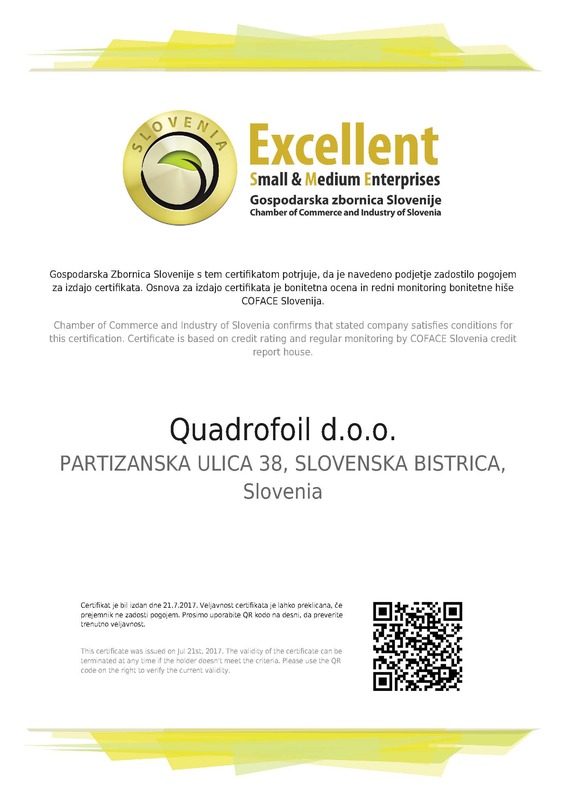 Slovenian Chamber of Commerce together with Credit risk assessment company Coface Slovenia awarded Quadrofoil with the Excellent SME Certificate. After a thorough business and operations review they placed the company among the best Slovenian small and medium businesses by credit rating. Quadrofoil credit rating is assessed as low risk and acceptable – the company’s financial culture is improving, its payments are still late but made within agreed time limits, cashflow is positive, assets and profit are growing. "Receiving this certificate is one of the proofs that we, slowly but surely, started to realize and materialize our boldness, vision of the future and innovative DNA. In the last year, beside finalization of the product and production, we also built or set-up the necessary business infrastructure and started moving from being a start-up towards becoming a strong and stable international company,” said Marjan M. Rožman, Quadrofoil president and CEO.